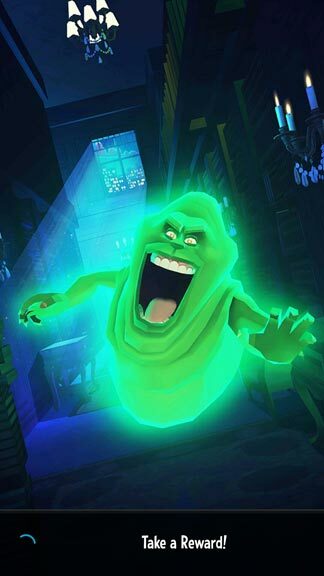 Ghostbusters: Slime City is another uninteresting free-to-play time-sink mobile game filled with little nudges, and occasionally some very blatant shoves, pushing you towards the in game IAPs. 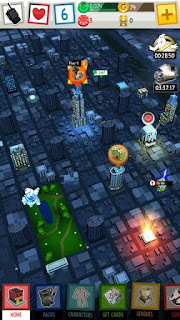 It combines elements of a city-builder, with card collecting, and some of the mobile rail-sliding gallery-shooters. In holding with the current cheap Ghostbusters marketing and lazy tie-in merchandise, just as the new film copies the original, and as the new Ghostbusters video game is a reskin of Sanctum of Slime, this game is itself quite literally a reskin of a reskin from EightPixelsSquare's Cartel Kings and All Guns Blazing. The gameplay consists of expanding you presence in Manhattan by starting with the Ghostbusters HQ and gathering building along the way to gather and hold more cash in the city building portion of the game. A main building tower stands as the story mode levels offering swiftly ramped up challenges for experience points and booster cards bonuses. You also get more playable levels in the form of contracts adding more opportunity to collect cards that act as boosters for the shooting gallery levels. After a player reach certain player levels, you can join a Squad and compete in PvP or assist other busters in group levels (although they are still played by yourself- just the scores are combined). The problem is that the level difficulties become extremely problematic too quick, greatly encouraging the use of IAPs to regain health, equipment upgrades, and booster cards. Although far too fast you can find yourself going from full health to no health with no chance to recoup it. Health can be drained nearly instantaneously if there are a handful of enemies all at once. Some of which have nearly a one-shot kill if they hit you, and if you can't shoot them because they are behind a bunch of other ghosts and various parts of scenery it becomes an unavoidable instant doom. To be fair the health can be regained between levels through chips earned by watching commercials for other games at the New York theater on the minimap or waiting for long amounts of time for it to replenish. In the end, it feels like an extremely unfair balance very heavily geared, as many free-to-play games are, towards the pay-to-win mentality. 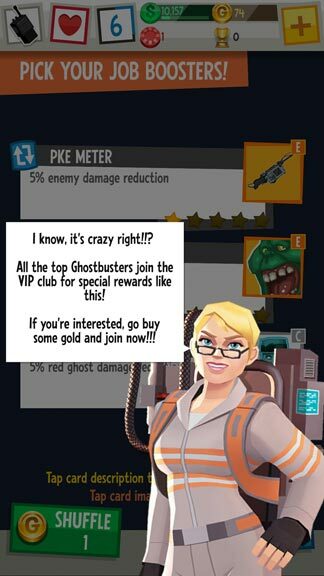 I mean look at the pic at the bottom of this post, one of many, pointing us towards spending- "ALL the top Ghostbusters join the VIP club!" This game seems like it was designed to be made as cheaply as possible, and funnel players directly towards paying. On a good note, I have to give them credit for the art style however. I really dig it and everything looks great. If they made this into a small 3rd person action game it could be a tremendously fun game with the stylized look. Overall, I think the most fun I had in the game is the bonus mini-game that pops up once in a while to feed Slimer. He appears near a hotdog cart and you have a certain amount of time to repeatedly swipe food into his mouth. I would think that these companies might put a little more effort into making something new and fun for the Ghostbusters universe, but alas, that is definitely not the case. The least they could've done is copy a decent Ghostbusters game, like the Nintendo DS or PSP versions of Ghostbusters: The Video Game, or even a newer shrunken down mobile port of the amazing console version of the game (my review here). That would've been so much better than this. As it is, the console game is essentially the third film and it is absolutely fun as hell to play- whereas this game is merely a time waster with little in the way of fun or action. 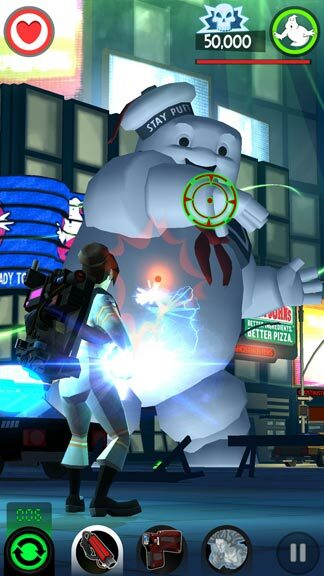 In fact I think the best Ghostbusters game for current mobile devices is actually Respawnables with the Ghostbusters bundle. Hopefully they'll run another ghost hunting campaign mode for the game when the film arrives this week. So don't bother with Ghostbusters: Slime City unless you are genuinely interested in tedious and repetitive gaming- it's as every bit as shallow as a reskin of a reskin could possibly be. In the mean time I'd recommend people play Little Ghostbusters instead.